You can enable users to add themselves using a configurable URL address. Enabling user self-registration saves administrators from having to invite all users or create them manually. Navigate to Settings > Self-Registration under Account Info. You’ll immediately be presented with the page below, so begin by selecting Enabled to activate Self-Registration. Moderated - Enabling this will force the administrator to approve each user as they register to join the account. This can be done by proceeding to either the Events page or within the administrator’s Event Stream. URL - This field determines the subdomain of the URL that will be given to users in order for them to register into the OneLogin account. Directly below is the URL that you will give out to users for registration. Default Role - As the user is invited into the account, this determines what Role they are given automatically, if any. Default Group - As the user is invited into the account, this determines what Group they are given automatically, if any. Email domain restrictions - Select Whitelist strategy to enter email domains (the part after the @) from which users can self-register. All others will be blocked. Select Blacklist strategy to enter email domains for addresses that should be blocked from self-registering. Enter multiple domains separated by commas. 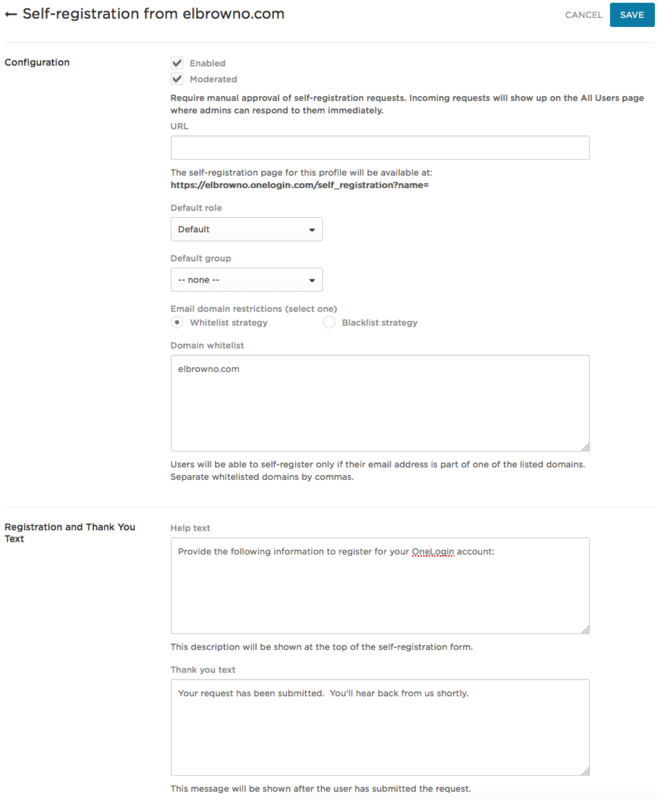 If a user tries to self-register from a blocked email domain, the self-registration form will provide a message explaining why they are blocked. Help Text - This field allows you to provide instructions to your users that will be displayed in the banner above the Registration form as the user registers into the account. Thank You Text - Any text put into this field will be displayed to the user upon completion and submission of the registration form. User Fields - Natively, the registration form will ask for a First Name, Last Name, and Email address. This setting allows you to define what additional fields that the user must enter upon applying from all custom fields. With your self-registration form configured, any user given the custom URL can now register into the account, either automatically or with administrative approval. Once the user has registered, an Event is created that appears both in the Activity > Events page. It also appears within the administrative Event Stream, found by selecting the bell icon in the upper left corner. If Moderated is enabled, the administrator must approve the user. This is done by proceeding to Users > All Users and then selecting the name of the user that has just self-registered. Once within the user’s profile page, toggle the Active switch at the top to activate the user and allow them to sign into their account.